An error during gallbladder surgery is a common source of medical malpractice claims, largely because this is a common form of surgery. Most malpractice claims from gallbladder surgery occur when a surgeon does not know where the biliary ducts are on a patient and cuts where the surgeon should not be cutting. The most definitive way to remove gallstones is to remove a patient’s gallbladder. Like the spleen, the gallbladder has some function in the body. But it is not a necessary organ. The gallbladder is a storage tank in your body. Think of it as one of those big storage tanks you see along the highway for fuel. In your body, the gallbladder helps store bile that is made by the liver to digest food. When you eat something that is hard to digest, the gallbladder helps the digestive process along by squirting a little bile into your digestive track. The bile is transmitted through a tube called the cystic duct over to the common bile duct. But the gallbladders are a bit fragile. One of the common problems is that clumps of stuff, called stones, form inside the gallbladder. When the stone passes from the gallbladder into the small intestine -- or it if lodges in the biliary duct -- it can be extremely painful. You do not need the gallbladder and the surgery is generally an outpatient procedure with a short recovery time. So it is usually a no-brainer to just take out the gallbladder. Accordingly, laparoscopic cholecystectomy has become a relatively standard procedure for dealing with gallstones. The technology employed in laparoscopic cholecystectomy is phenomenal. The surgeon uses a camera that gives a great view of the patient’s abdomen. In taking out the gallbladder, the surgeon has to cut the cystic duct. Before doing so, the surgeon seals the cystic duct with a clip so that bile does not run loose throughout the stomach. But it is important to protect the common bile duct. What happens in cases that end up as malpractice lawsuits is the doctor cuts the bile duct because they confuse it with the cystic duct. Early on in a laparoscopic cholecystectomy, if there is any question as to where the ducts are, the surgeon can perform an intraoperative cholangiogram, which is an x-ray that gives the doctor a good clear view. The Society of American Gastrointestinal and Endoscopic Surgeons recommends that these intraoperative cholangiograms should "be applied liberally" before surgery to help see the nuances of the patient’s anatomy. In spite of this, cholangiograms are done in only 5-10% of laparoscopic gallbladder surgeries. The malpractice problem arises because of doctors with very different skill levels performing gallstone surgery. Remember, this is not a rare procedure. There are not a handful of skilled specialists performing this surgery – lots of doctors do it. There is also a financial motivation that attracts surgeons to this minimally invasive procedure (including a lot of gallbladder removal procedures for patients that did not have stones). When this procedure was developed in 1989, surgeons rushed in massive numbers to learn the surgery, taking weekend courses in laparoscopic cholecystectomy by practicing on pigs and then rushing – lucratively – to patients. In fact, so many patients had their gallbladders unnecessarily removed that hospitals threatened to revoke the privileges of doctors who were rushing patients to surgery in mass numbers. To this day, there are a lot of doctors performing this surgery who should not be performing the surgery because they are not qualified. Certainly, the goal is to avoid cutting any duct but cutting (or failing to secure) the common bile duct causes the most medical malpractice lawsuits. When the common bile duct is compromised, there are often no immediate symptoms. But, eventually, bile may leak into the abdomen which can lead to serious complications, such as strictures, cholangitis and pancreatitis, and other complications that, if not identified and carefully monitored, can result in death. If the bile duct is completely cut, bile is invariably going to leak into the stomach, causing serious and sometimes fatal complications. Often, even in less severe cases, the compromised bile duct needs to be repaired, requiring another surgery, an extended hospital stay and thousands of dollars in unnecessary medical bills. Is Cutting the Bile Duct Malpractice? Many doctors have argued that cutting or nicking the common bile duct is an inherent risk of gallbladder surgery. Dr. Josef E. Fischer, a Harvard doctor, writes a polemic on this subject in an editorial in the American Journal of Surgery in 2009, lashing out at malpractice lawyers and arguing that 97% of injuries during gallbladder surgery are not caused my medical negligence. Dr. Fischer acknowledges that many surgeons disagree with him and also acknowledges that there is a lot of recent medical literature that underscores quality ways to avoid compromising the bile duct during surgery. It is worth nothing: the National Institute of Health reports that laparoscopic gallbladder surgery injuries are more likely to occur when a surgeon has performed fewer than 25 procedures. More recent studies have confirmed that the risk of a bile duct injury is much greater during the surgeon's learning curve, it continues to be greater than the injury rate for open cholecystectomies even after the surgeon has gained considerable experience with the procedure. 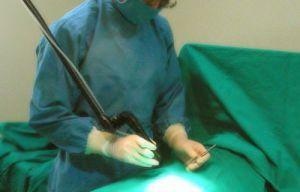 (11) It has been stated that the rate for duct injury with the laparoscopic procedure is as high as 3 percent. This underscores the obvious: skill matters when a surgeon is removing a gallbladder. Get sample verdicts in gallbladder removal malpractice cases. Can an experienced surgeon using ordinary care cut this common bile duct? The answer is almost certainly yes. But injury from cutting the common bile duct is often the result of medical malpractice. As any malpractice lawyer will tell you, it is the same surgeons who are “frequent flyers” in malpractice claims involving common bile duct injuries. Like any politician can tell you, what can often be the larger problem in a lap chole case is the what happens after the malpractice occurs. Sometimes, repair of an injury to the common bile duct during the procedure is a simple reconstruction of the duct. But the surgeon willfully ignores the injury or does not look to see if the common bile duct has been compromised, the injury might not be discovered until real damages has been done. Besides a bile duct injury, another problematic complication that often ensues when gallbladder surgery goes awry is bleeding. While minor bleeding is quite common, the surgeon must get the patient back to hemostasis before closing the patient's surgical wound. One red flag is bleeding in the triangle of Calot (the triangle the common hepatic duct laterally, the cystic duct medically, and the inferior edge of the liver superiorly. If a doctor drops the ball and does not properly apply the surgical clips, that is going to lead to bleeding. Often when bleeding goes awry, the surgeon will try to sweep it under the rug instead of getting needed help from a vascular surgeon. Even those that appear to be slam-dunk malpractice lawsuits for cutting the common bile duct and causing injury to the patient are routinely defended. The classic defense in these cases is the “known risk” defense which pretends that malpractice is not possible if the injury is a known risk. But this is a nonsense defense. What matters is whether the injury caused in the case could have been avoided by reasonable care, not whether the general injury can happen without negligence. There is a risk every time we get behind the wheel of a car. When a driver comes across the center line on the highway and hits you head-on, will the negligent driver use the defense that accidents are a known risk when you drive a car? Is the phase "known risk" an automatic get out of jail free card that means the driver is not obligated to take personal responsibility for the injuries they cause? Of course not. It is overly simplistic and just plain ridiculous… and regrettably, it can work, especially when plaintiffs’ malpractice lawyers do not frame the issue properly for the jury. Another common defense is the “patient had unusual anatomy” or “he/she was too fat to be able to see” defenses. These are slightly more saleable defenses in some cases. But it is often a reflex of surgeons being sued for malpractice. Typically, there is nothing to suggest unusual anatomy and no explanation as to why the doctor did not try to use a cholangiogram (which malpractice cases rarely involve) to figure out what belonged where. You can read with greater detail about the defense doctors raise in these cases here. Our malpractice lawyers handle cases where the bile duct is cut or damaged during surgery when serious injury is caused to the patient. Our clients have recovered millions of dollars in settlements and verdicts in lap chole cases in and out of Maryland. If you or a loved one suffered from complications as a result of an error or mistake during gallbladder surgery, call our malpractice lawyers at 800-553-8082 or get a free online consultation.